A Place at the Altar illuminates a previously underappreciated dimension of religion in ancient Rome: the role of priestesses in civic cult. 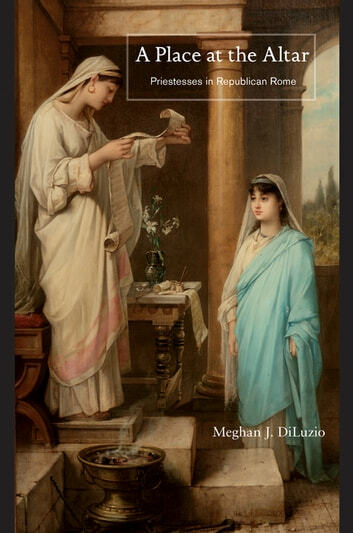 Demonstrating that priestesses had a central place in public rituals and institutions, Meghan DiLuzio emphasizes the complex, gender-inclusive nature of Roman priesthood. In ancient Rome, priestly service was a cooperative endeavor, requiring men and women, husbands and wives, and elite Romans and slaves to work together to manage the community's relationship with its gods. Like their male colleagues, priestesses offered sacrifices on behalf of the Roman people, and prayed for the community’s well-being. As they carried out their ritual obligations, they were assisted by female cult personnel, many of them slave women. DiLuzio explores the central role of the Vestal Virgins and shows that they occupied just one type of priestly office open to women. Some priestesses, including the flaminica Dialis, the regina sacrorum, and the wives of the curial priests, served as part of priestly couples. Others, such as the priestesses of Ceres and Fortuna Muliebris, were largely autonomous. A Place at the Altar offers a fresh understanding of how the women of ancient Rome played a leading role in public cult.